…and heeeeere we go again! The start of the work week is driven by the Moon in Aquarius, seeking to be appreciated for being unique and equal in stature. May everyone in your assorted groups be regarded as such. Arise, go forth and network. The Moon is dead. It was dead yesterday during the most dead and boring Super Bowl of all time, so people are saying. 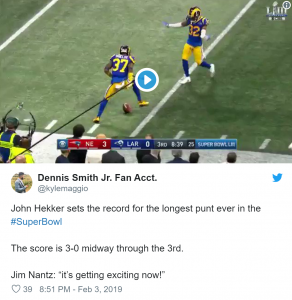 If people wanted an exciting game, it should have been held before Friday’s brutal Mars-Pluto square…or even earlier in January, before certain powerful patterns released in the horoscopes of Tom Brady and Jared Goff (the quarterbacks for the Patriots and the Rams). Instead it was held on a dead Moon traveling with no aspects to other planets all day (and thus reflecting the lack of tension in the game). Even the Super Bowl half time show was reportedly D.O.A. I tuned in around 8:15 PM ET — looked at the chart for the start of the game and posted the potential for a boundary-pushing action around 8:51 PM ET — no later — on a friend’s Facebook page. Lo and behold, there was a record-breaking punt around 8:49-ish…and no one following my friend’s Facebook page was impressed. Sheesh! I stopped following the game. Who won? The Moon will no longer be dead at 4:04 PM ET, when it meets up with the Sun at 15 degrees of Aquarius. The Sabian Symbol for this New Moon is “a big businessman at his desk.” Sabian Sage Blain Bovee writes that “this is an image of dealing with shining matters of importance plowing through work that must be done with an eye to that which must be done first.” A big businessman is an image of a formidable presence with widespread influence….but wait- wait- wait! Bovee assures us that this is meant to be a positive image, and we are advised to approach this lunar cycle with a mind to a “big, cheery outlook; an influence that spreads from a brilliant, radiant core; a warming to a sense of responsibility; glimmers of hope.” If there is a downside, it may show up as “shallow officiousness; hollow platitudes; an impostor.” Indeed. 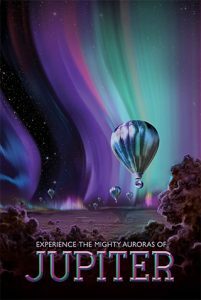 TUESDAY: Moon sextile Mars at 8:49 AM ET — easy application of pioneering action. Moon sextile Uranus at 6:59 PM ET — innovation, inclusion; manageable disruption. Moon will be void until 9:02 PM ET, when it enters Pisces. WEDNESDAY: Moon in Pisces all day — with only one aspect — happening at 2:33 AM ET between the Moon and Venus. Go with the intuitive flow. This lack of planetary activity is similar to what was (not) happening during yesterday’s Super Bowl. FRIDAY: …at 9:34 AM ET, when it charges into me-me-me Aries, looking to get something started. Fascinatingly, there are no aspects to the Moon until 9:21 PM ET, when Moon squares Venus. Whose me-me-me initiative will clash with someone else’s social standing? Until then, put yourself on cruise control and hit the road. SATURDAY: More Moon in Aries on cruise control. That’s right — no bumps in the road until around 5 PM ET, when Moon squares Saturn. Use your wits as you may be pleasantly surprised at your creative solution, as Mercury sextiles Uranus at 5:53 PM ET. The potential for innovative thinking is in effect all week. SUNDAY: Now we are getting busy. Moon makes its weekly clash with Pluto at 4:50 AM ET; watch for the usual power play in the headlines. Mercury — how we need to think — leaves rocket scientist Aquarius at 5:51 AM ET. It will be in Pisces until April 16th and deserves more attention than I’m prepared to deliver now, so stay tuned. The Aries Moon meets up with Mars and Uranus around 4 and 7 PM ET, respectively. Time to shake, rattle and roll. Now then. Humming in the background of all of the above, including the energetic imprint of today’s New Moon is this: Mars in Aries meeting up with Uranus at the very very very last degree of Aries, exact on February 13th at 1:19 AM ET. 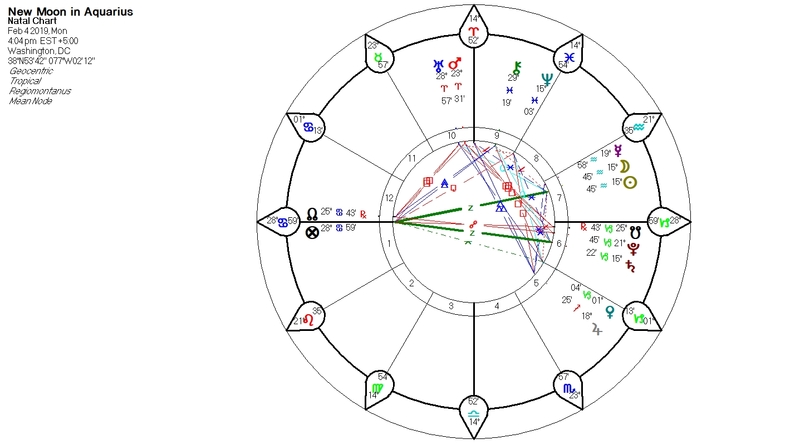 On the 14th, Mars will leave Aries for Taurus (to be discussed in a future forecast) and will trigger 1) the horoscope of The Donald’s inauguration and 2) the horoscope of Nancy Pelosi, both of which were eclipsed by the total lunar eclipse on January 21st. We should see some daring actions and assertions right about then…and in the news in general. 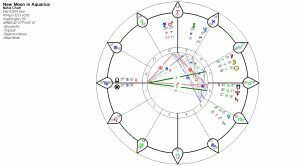 In the New Moon chart set in Washington DC, we see that Mars-Uranus meet-up strongly placed in the 10th House, there for all the world to see. Last Friday’s square between Mars and Pluto suggested something explosive hitting the wires as the clock approached 10:15 PM ET. Cue Virginia Governor Ralph Northam, a pediatric neurologist whose comments on a proposed state bill loosening controls on third-trimester abortions prompted outrage in certain circles earlier in the week. On Friday around the time of that Mars-Pluto square, Northam’s yearbook page from his days at medical school in 1984 went viral — prompting outrage and calls for his resignation from all of humanity. Perhaps his firing bodes well for Alabama, where a police officer is facing a second trial on charges of violating the civil rights of an Indian grandfather out for a morning stroll, i.e., Walking While Brown. Inexplicably — yet captured on tape — the grandfather was slammed to the ground and ended up in the hospital. Putting this into an astro-logical perspective, history buffs will recall that civil rights was a hot button issue in the mid-60s, when Uranus and Pluto were conjunct in Virgo. Now that Uranus and Pluto are square to each other, we would expect matters that were hot in the 60s to be hot again now. Sure, seeds were planted in the 60s — but now we are finding out if those seeds will flourish. With respect to the United States, its horoscope is experiencing a potentially anguishing transit of Pluto to the US Saturn. It is time for the US to face its dark side. What’s going on now in the U.S. horoscope is that transiting SATURN is squaring the U.S. Saturn, which it will do three times this year. Saturn can act as a karma cop, demanding accountability and consequences. Meanwhile, the State of the Union is on tomorrow night at 9 PM ET in DC. The Aquarius Moon will be void, but right on The Donald’s 29 degree Aquarius Descendant. That’s a helpful aspect for someone making a public speech. Moon enters Pisces at 9:02 PM ET and it will sextile Venus. I expect we will hear beautiful words, perhaps the most beautiful we’ve ever heard involving Pisces themes: compassion, unity, suffering, drugs, refugees plus optimism, optimism optimism. Of course Stacey Abrams has been asked to deliver the Democratic rebuttal, given that transiting Jupiter exactly conjoined her Sagittarius Sun on January 30th. This suggests strong potential for positive and expansive opportunities all through 2019. If Georgia’s gubernatorial election were held today, I suspect she would win hands down. No birth time for Ms. Abrams, just December 9, 1973 in Madison, WI. In other news, many people would like ex-Starbucks CEO Howard Schultz to shut up and go away, instead of run for president as an independent candidate. The anguish he may be feeling by the hostile reception is suggested by transiting Pluto square his Saturn three times in 2019 (July 19, 1953 in Brooklyn, NY). Clearly the man does not have an astrologer on his team. Hostile reception or not, Mr. Schultz is still likely to be buzzing with innovative and disruptive ideas, backed by force of will and action. Transiting Uranus squares his Mercury (buzz, buzz), followed by transiting Pluto opposing his Mars (force of will/action). Plus, transiting Jupiter has just conjoined his natal Jupiter, so we can appreciate why he’s feeling so expansive. If he persists, he will then be pushing against the squeeze of transiting Saturn opposing his Cancer Sun in 2020. More than one declared candidate has a challenging Saturn-Sun pattern in his/her horoscope in 2019 or 2020. What a contest this will be. Ah. Before I forget: yesterday’s Mercury-Jupter sextile coupled with Venus at the Aries Point suggested publishing pulling focus. Lots of people are saying their favorite Super Bowl ad was this one narrated by Tom Hanks, presented by the Washington Post. Of course it would be Tom Hanks, because astrology. Here is his horoscope. I’m interested to see what will hit the headlines when Jupiter is at 17-18 degrees of Virgo this November and next March and July. These were the degrees of the game-changing Uranus-Pluto conjunctions of 1965 and 1966. I expect we’ll see expanded progress on the seeds planted at that time, including, but not limited to: awareness of climate change and other ways human behavior is impacting ecological systems; awareness of subatomic particles, e.g. the Higgs boson; health care systems such as Medicare (which was created in the mid-60s). Read your history books and fill in the rest of the possibilities. Jupiter, as you know, is in that 17-18 Sagittarius range now, squaring 17-18 degrees of Virgo. It will be there again in June, late September and early October. Optimism, optimism, optimism…as we approach this New Moon in Aquarius. To find out what it holds for your horoscope, here’s how to contact me for a personal consultation.